On September 16th, I received an email from a publicist in Chicago, Madelaine, inviting me and a guest to enjoy a complimentary brunch at the new restaurant in The Kimpton Journeyman Hotel in Milwaukee’s Historic Third Ward. The invitation to Tre Rivali was for Saturday brunch for two (“on the house”), so I decided it was a great opportunity to invite my visiting friend to join me a what could be the “hot new spot”! My friend, Rich, was scheduled to visit me during the weekend of Oct 7-9th, and the ONLY thing I had planned was this brunch on Saturday the 8th. Before I get into the experience at Tre Rivali, please let me tell you that, despite an intentional lack of planning, Rich and I covered (literally) lots of ground in Milwaukee, walking all over the city and visiting: the lakefront, Lakefront Brewery, Colectivo Coffee, Jackson’s Blue Ribbon Pub (Go Tribe!, Go Clemson! ), the Pabst Mansion, the Harley Davidson museum, Kanpai Izakaya, Bugsy’s Back Alley Speakeasy and finally, Zak’s Cafe. It was a busy, fun and social weekend with other friends joining in here and there! Back to Tre Rivali. We walked over to the Journeyman and entered a posh, but not intimidating boutique hotel. Here are some of their photos. The restaurant is off to the left of the lobby, and I first thought it to be a coffee shop. Had we entered from the street, it would have been more obvious to me! (May I please have a break – it was still morning!). There are two main areas within the restaurant. The room one enters is beautifully tiled, with a casually comfortable feel. The second room, which is all dining space almost had a bit of a cottage type of feel with large comfy cushions and white “siding”. It was a very inviting space. 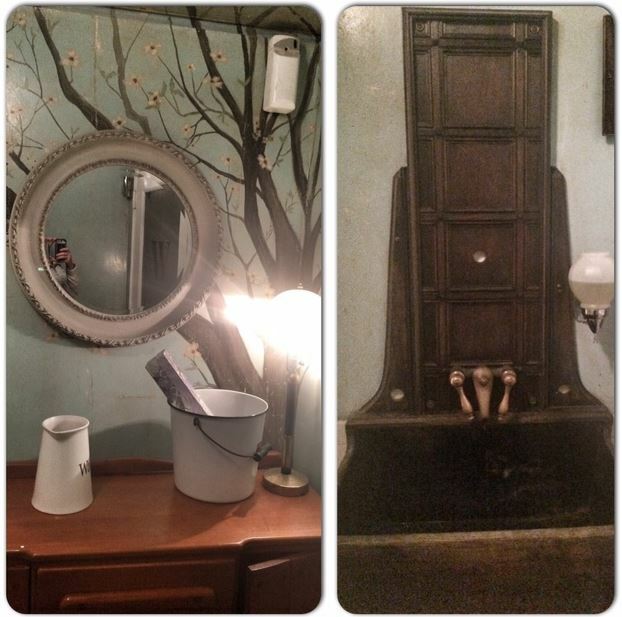 Please note that the photo in the upper right is from the Journeyman Hotel’s Instagram page. One of the disappointments of the weekend was the lack of good service at some of (not all of) the aforementioned establishments. 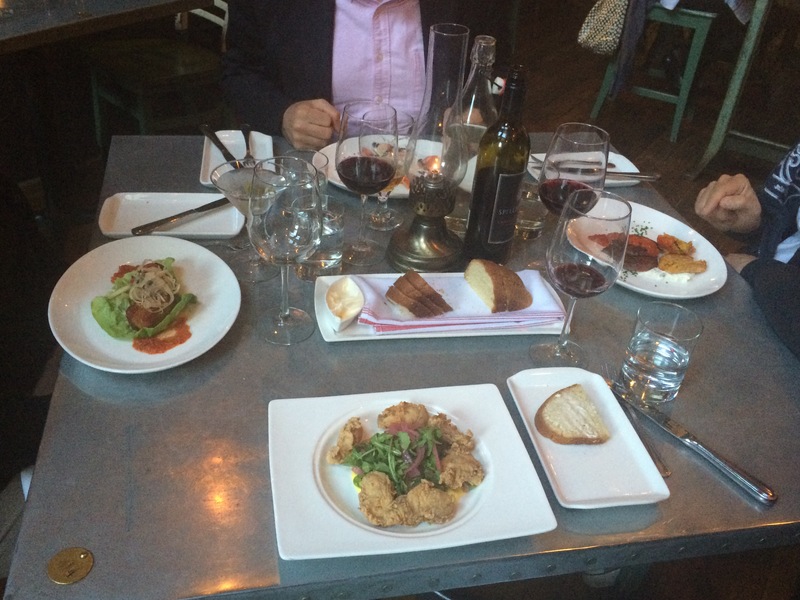 We had EXCELLENT service at Tre Rivali. 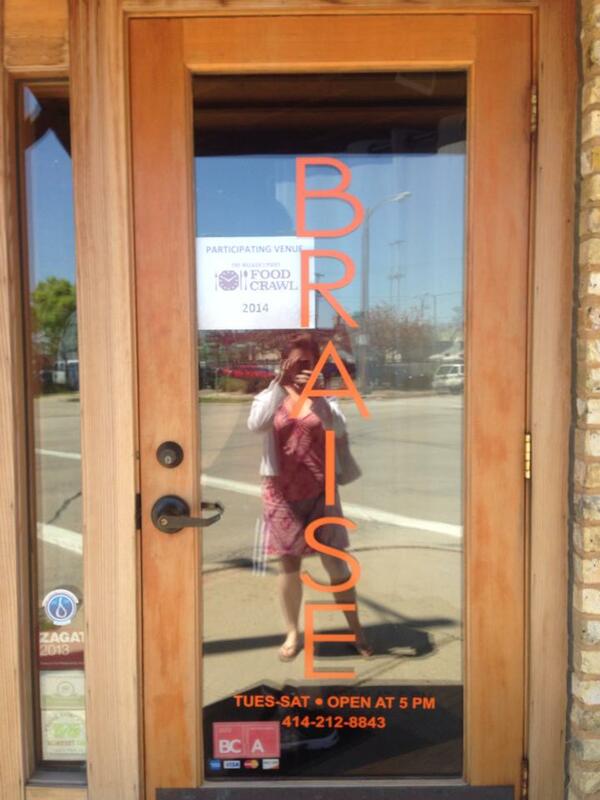 Larissa was our server, and she was prompt, happy, enthusiastic, and knowledgeable. Rich asked me if I planned to let her choose my meal, and after perusing the menu, I had decided “yes”. There were many good options from which to choose, so why not let the expert do the choosing? And, Larissa was right on board! So much so that Rich felt compelled to “step outside of his comfort zone” and have her choose his meal as well! Larissa chose the avocado toast for me. She had no idea how much I love both avocado and poached egg! This light whole grain toast was smothered in avocado, and topped with radishes, sprouts, olive oil and a poached egg. It wasn’t overly-flavorful, but had nice texture and the radishes gave a slight “bite” to it. For Rich, Larissa chose the beef burger which was topped with bacon jam pesto aioli, Fontina cheese and a sunny-side up egg. This was no small feat, and required a knife and fork, in my opinion! Rich was also served a bowl of the cucumber gazpacho (such a delicious side of soup!). Since he and I split our dishes down the middle and tried a bit of everything, I can personally attest to the fact that the burger was FULL of flavor and quite filling! As I mentioned, the gazpacho was extraordinary, with cucumber flavor cooling the palate beautifully! 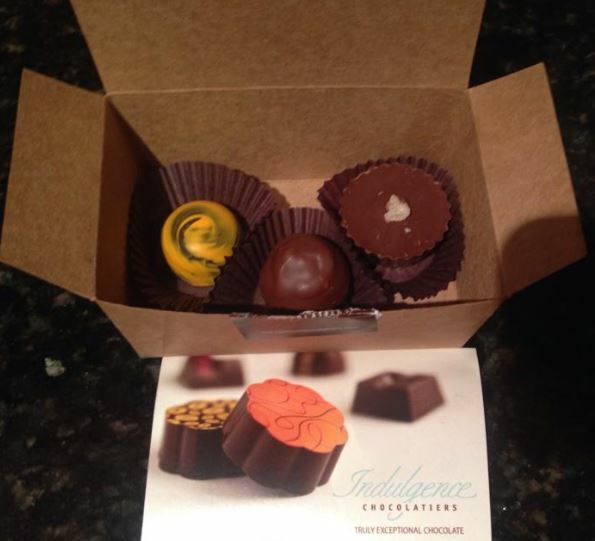 I feel very fortunate that local companies reach out to me to try new venues and provide feedback. This was a great experience at new spot downtown. I’ve seen other friends post about brunch at Tre Rivali as well. I hope they had similarly nice experiences! It’s certainly a restaurant I will keep in mind as the visitors keep coming (or when I just want a good brunch downtown!). Thank you for a wonderful morning meal, Larissa and Tre Rivali. I flew out to Baltimore last week to attend my third PSTC (Pressure Sensitive Tape Council) conference. It’s not a large conference, but a very focused industry event. I found myself getting to know new colleagues from a sister company, spending lots of quality time with key customers, and bonding with newer colleagues from my own company. In all, it was a great week (and I normally loathe being away for almost a week – especially while having a senior dog (and having recently said goodbye to my other senior dog)). On my first evening in Baltimore, I met two new colleagues from Arkema Coating Resins for dinner. I immediately knew Pat (the planner of the evening) and I would get along. He promised me “a good restaurant”! 😉 Keith, a technical guy and I also hit it off quite quickly – lots of common interests! It’s awesome to feel such a natural connection with guys I had never met, and who live in NJ and NC, respectively. Yet, we are now “family”! We met at the cocktail hour reception at PSTC (quite literally one hour, folks…so we weren’t staying long). 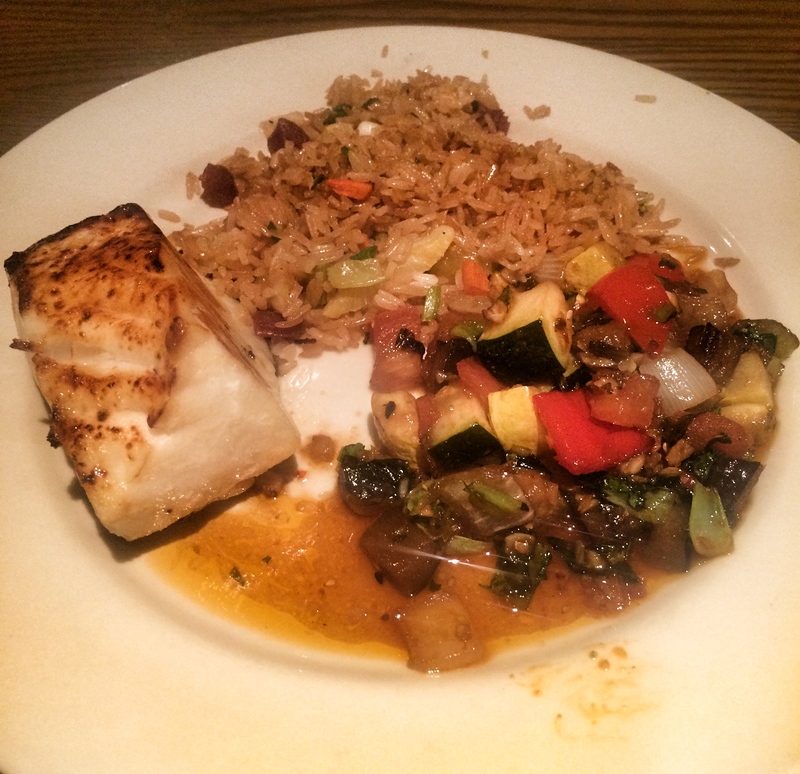 We walked several blocks over to Kona Grill and immediately realized we were in a good spot for a seafood dinner! Here is the menu. We were hungry, so we knew we wanted appetizers. Pat chose the Shrimp Diablo (diablo sauce, danish bleu, bleu cheese sauce), and then Keith turned the second option over to Robbie, our server. 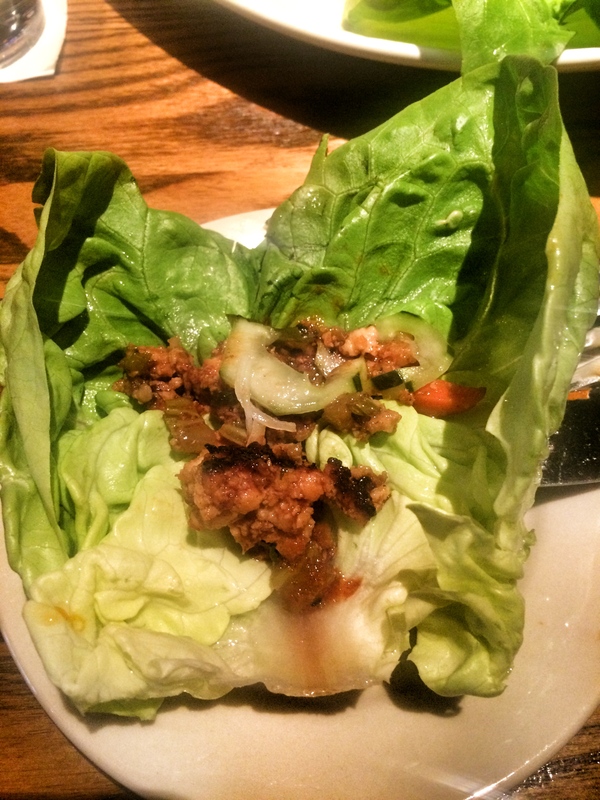 He chose the chicken + shrimp lettuce wraps (bibb lettuce, cucumber salad, spicy sesame vinaigrette). Both appetizers were delicious, and we devoured every last bite! Robbie charmed me immediately with his great sense of humor (stepping back to “reset” as he flubbed when describing the evening’s special (which Pat ordered)). I can definitely appreciate someone who can laugh at himself and who can also recover so nicely after a minor “trip up”. 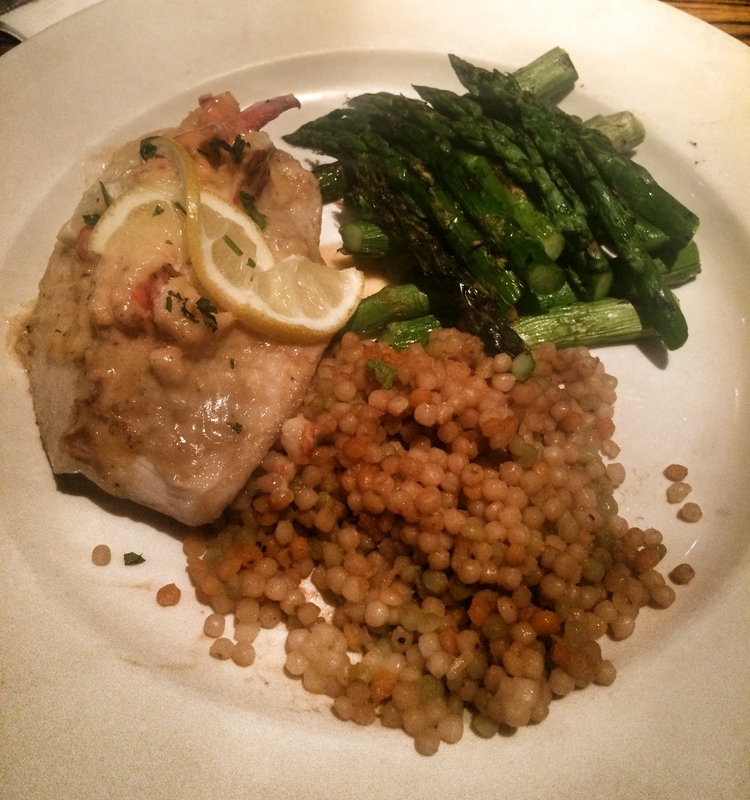 The entree he chose for me was the Snapper topped with crab meat, served with couscous and asparagus. Normally, couscous doesn’t seem like an interesting side, but Kona’s couscous had really good flavor and texture to it! Delicious! And, my colleagues had equally delicious, and beautifully plated dishes as well! 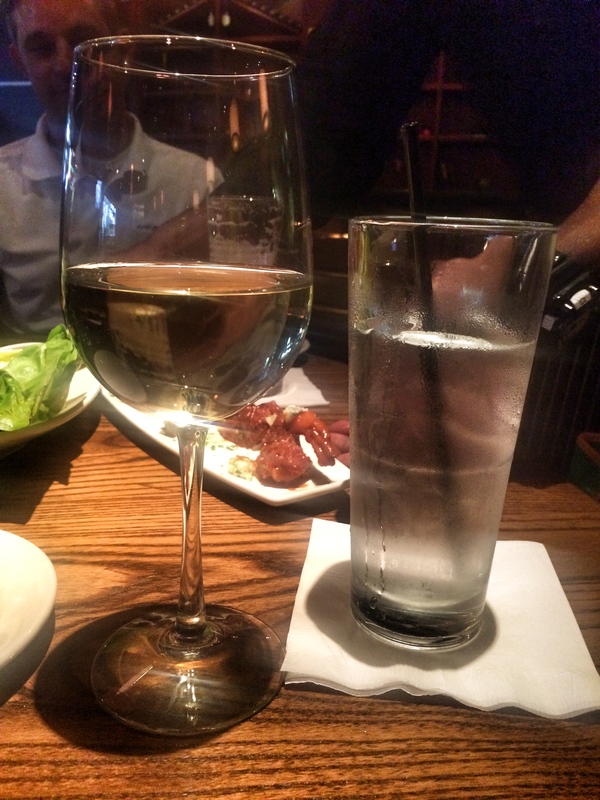 In addition to having a very pleasant server who was quite open-minded and excited about “She Ordered What?”, I had good quality time to get to know my new colleagues and to chat about both business and personal interests. On Wednesday, we decided to have a casual evening and walk over to Oriole Park at Camden Yards to watch the O’s take on the Toronto Blue Jays. 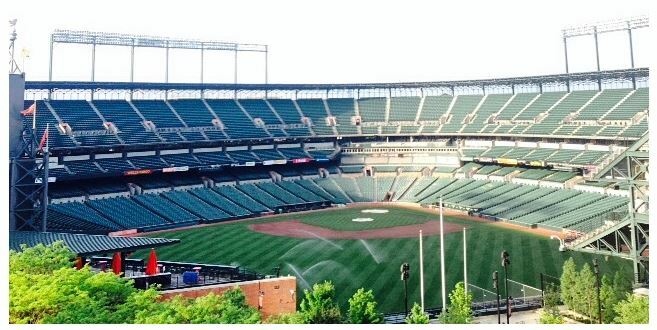 I had never been to Camden Yards, so I was excited to check that ballpark off the bucket list of venues to visit! If you haven’t been, you’ll see that it’s beautifully situated in the heart of the city and the brickwork makes it an absolutely beautiful area! The view from my hotel room! Thank you, Hilton Baltimore! Of course, it was a hot dog and beer kind of night. No fancy dining while watching America’s pastime! And, the Orioles won 6-1 that evening, so it made the local experience all the better! Thursday, however, was a different story. 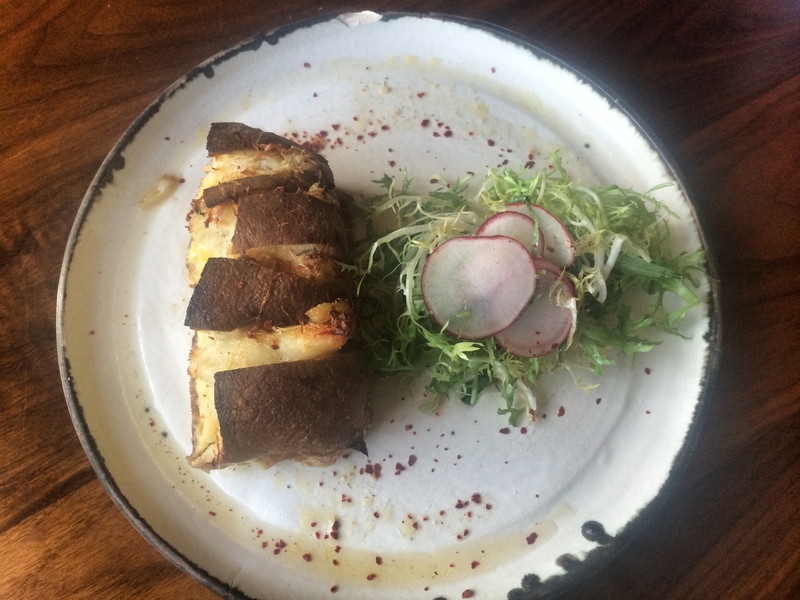 I was totally set on going to my hotel room for the evening to write meeting notes, but my colleagues convinced me to venture out for dinner at a restaurant an industry contact recommended – The Fork & Wrench. 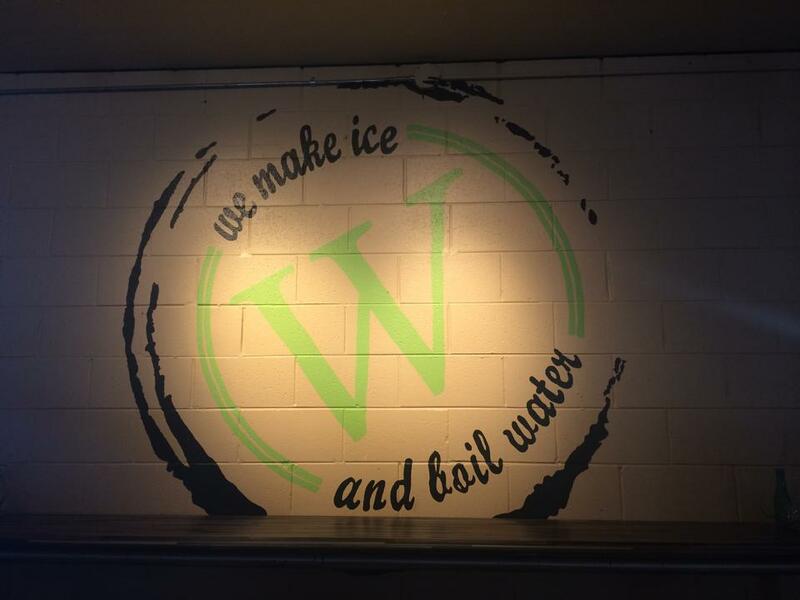 It’s perfectly described as a “boutique dive bar”, and founded by Cyrus Keefer, (associated with that well-known James Beard foundation!). 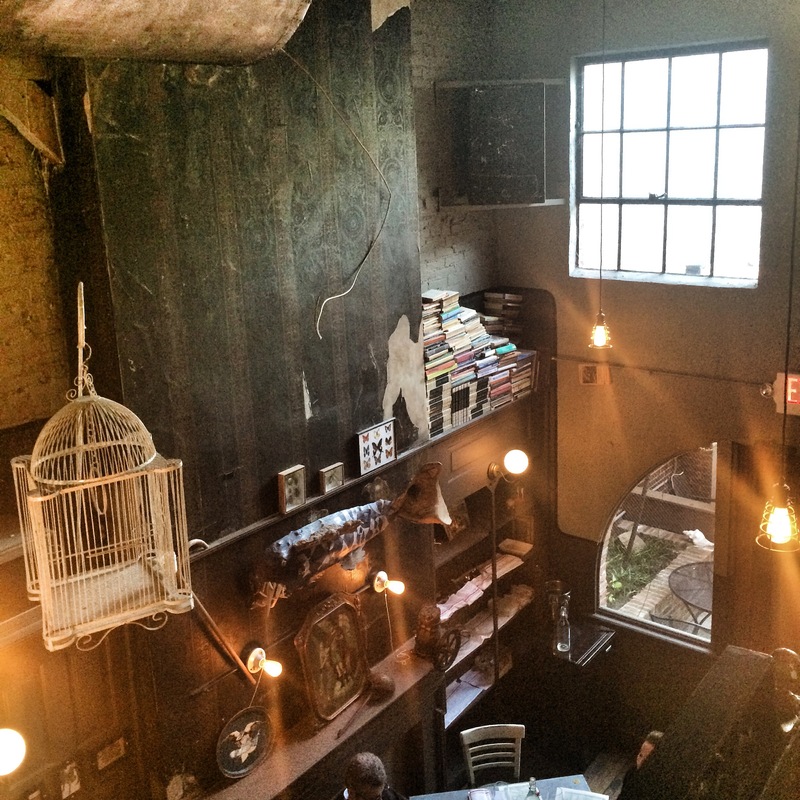 The Fork & Wrench is an eclectic and charming space! The staff all greeted us warmly, and at ~6:30 on a Thursday night, we were able to grab a table for four with no problem. Well, except the fact that we were all still reeling from one of the worst cab rides I’ve ever experienced. 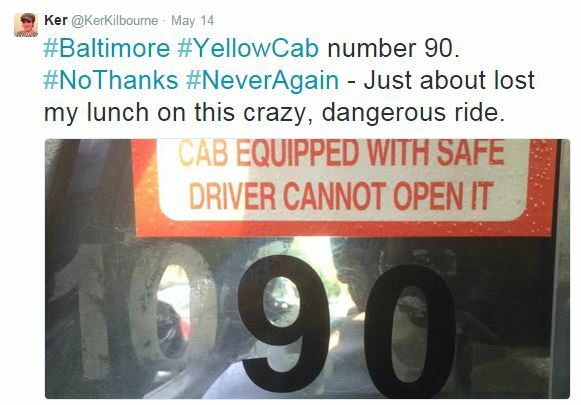 To the driver of cab number 90 in Baltimore: I will NEVER get into your vehicle again! It was so bad I took a picture AND tweeted about this dangerous ride! I have a strong stomach, but all four of us wanted to bail multiple times during this 2 mile / 35 minute cab ride!!! A quick glance at the menu, and I knew everything would be wonderful. My colleague was really trying hard to “move out of her comfort zone”, so she was quite impressed when she saw me hand my blog card to our server, Greg. He read it, and was totally up for the task! The only question he asked me was how hungry I was. Answer: pretty darned hungry! 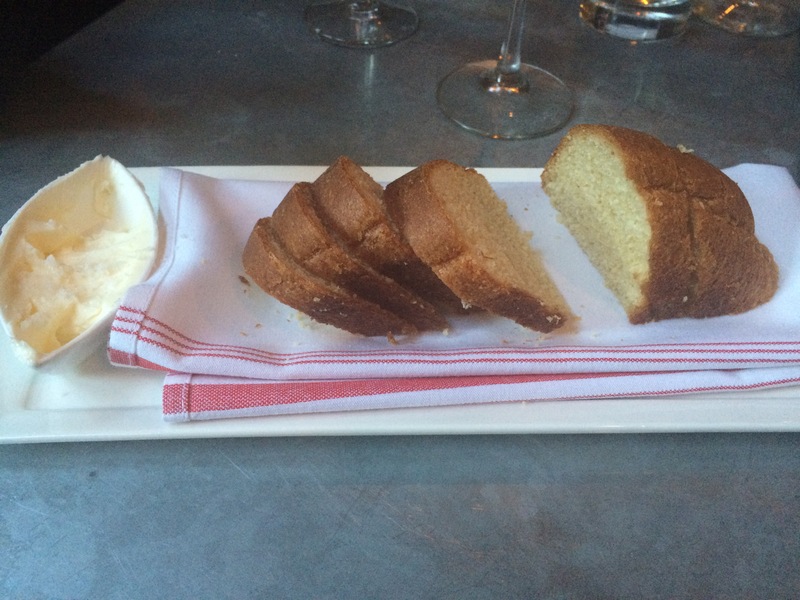 The meal started with fresh bread and salted butter (delicious!). 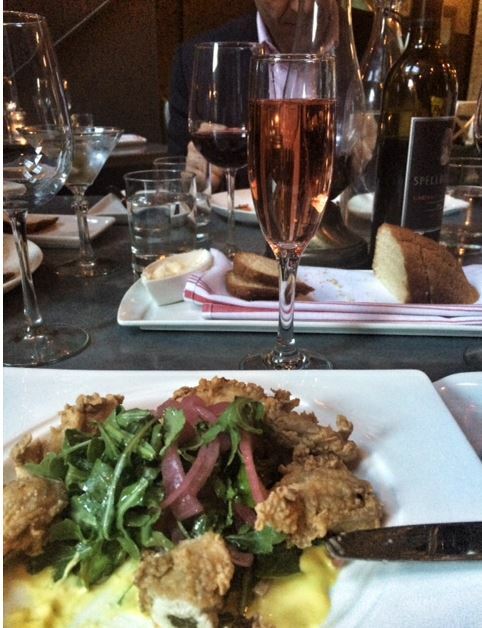 Then came fried oysters, served with a glass of Simonnet Febvre Brut Rosé . For good measure, I took a picture of all of the appetizers on our table. You’ll see smoked Beef Tongue with tostones, aji marmalade & cilantro crema on the right, and Ssamjang Glazed Pork Belly with green papaya relish, kimchi purée & Bibb lettuce on the left (the colleague who stepped out of her comfort zone – and thoroughly enjoyed her appetizer!). 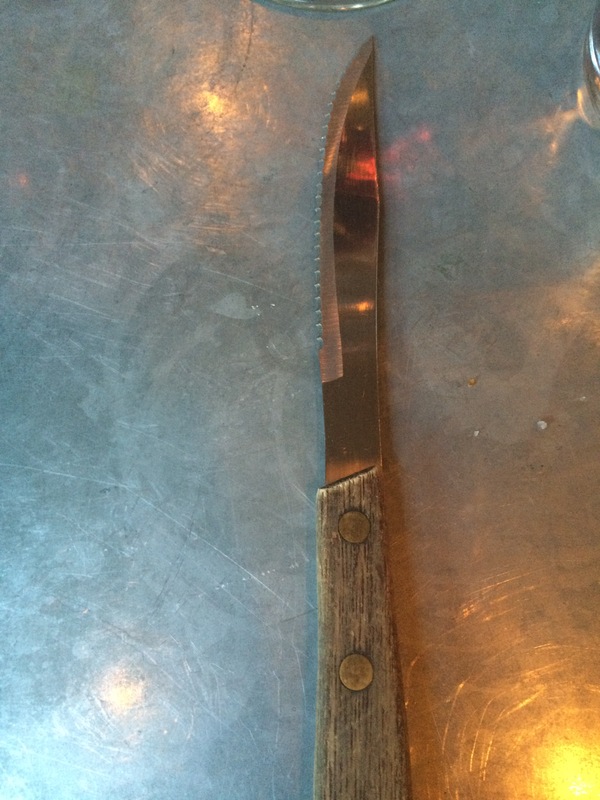 I teased Greg that he gave me a clue about my entrée when he set down a serrated knife. For my entree, Greg was not the person to serve me, so I wasn’t sure if I should claim the dish that was presented or not! After all, this was a surprise! When I mentioned that it “might” be my dinner, the server sat the plate down and then excitedly told me that everyone in the kitchen saw the blog card and thought it was such a cool idea! I have to admit that I got pretty excited by that response as well! 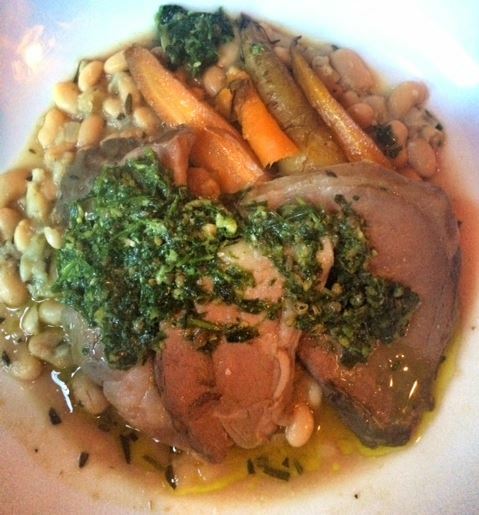 It turns out that I was served the Leg of Lamb served over stewed white beans, baby carrots & wild ramp salsa verde. Extremely tender meat and really nice flavor! I felt like it was a reasonably healthy dish as well – lots of veggies and no heavy cream sauce. That makes up for all of the gorging, right? I couldn’t possibly finish it all, but I wanted to! And, it turns out that I didn’t need that serrated knife – the meat was that tender! Although I was overly full, Greg had already decided that I needed to try dessert as well. I mentioned on Instagram that I (jokingly) thought I found my soulmate in Greg. He picked the dessert that had immediately caught my eye. 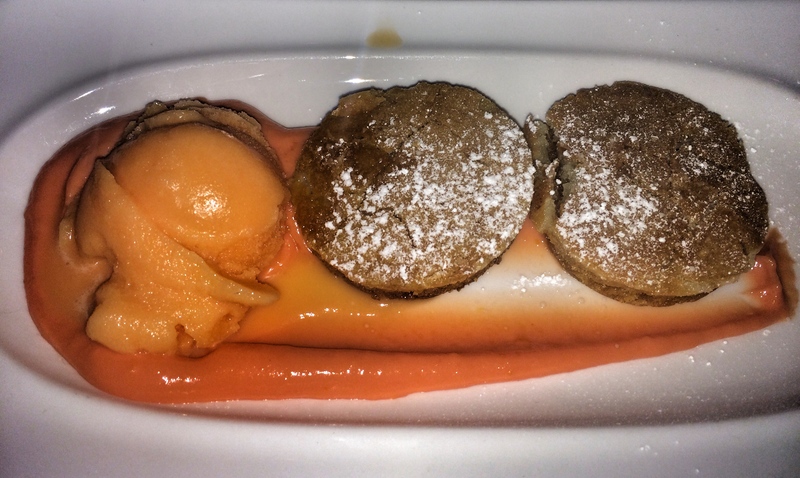 The “Creamsicle” Gooey Butter Cake with blood orange curd, orange sherbet. Y’all know how much I love a citrus dessert! But, let me tell you that the butter cake was the absolute BOMB. I wasn’t hungry any longer, but I would have licked that plate clean if it were socially acceptable! On the way out, I stopped in the Ladies’ room, and I even felt compelled to take photos there. Such a charming space! It’s no wonder Baltimore is called “Charm City”. Everyone I met was very pleasant, our servers Robbie and Greg were both charming men, and the spaces and places we visited had unique charm and character. Now, time to get back to healthy eating and exercise! No more binging! I hope you enjoyed my recap of my visit to Baltimore as much as I enjoyed the visit! Ringing in the New Year – Out & About in Milwaukee with Good Friends! Upon returning from Ohio in time to watch my Clemson Tigers beat Oklahoma in the Russell Athletic Bowl (yes, my priorities are a bit odd! ), I found myself preparing for a visit from my dear friend Dana. Dana has been mentioned here (actually, she wrote that post! ), here, and here. She was driving in from Michigan the morning after I arrived back home, and planned to spend a few days in Milwaukee over the New Year’s week. 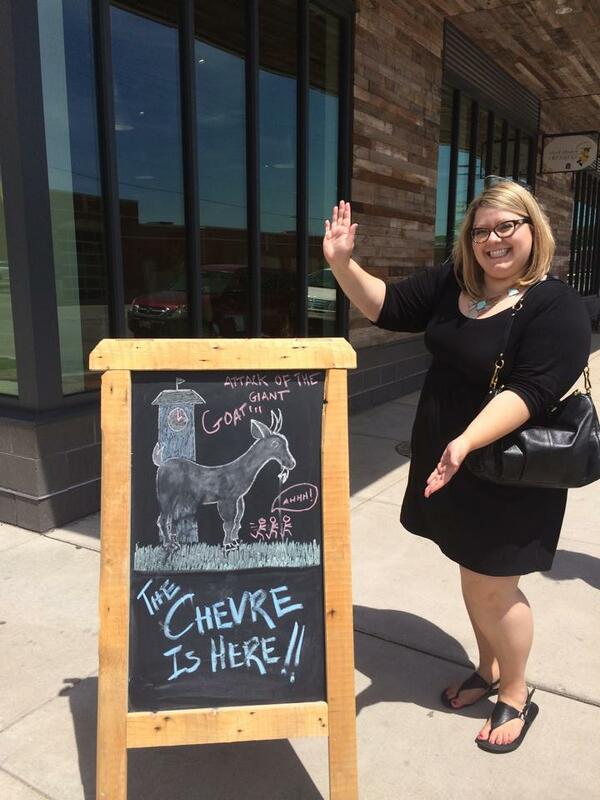 Dana is a wonderful and curious traveler, so she suggested several local things to try. Before I get into how Dana and I ate our way through New Year’s week, I’ll share a few pictures of the other things we saw and did. 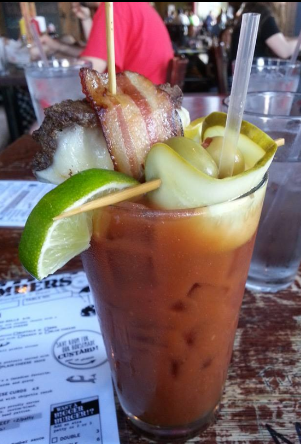 First, Dana needed her Bloody Mary from AJ Bombers! 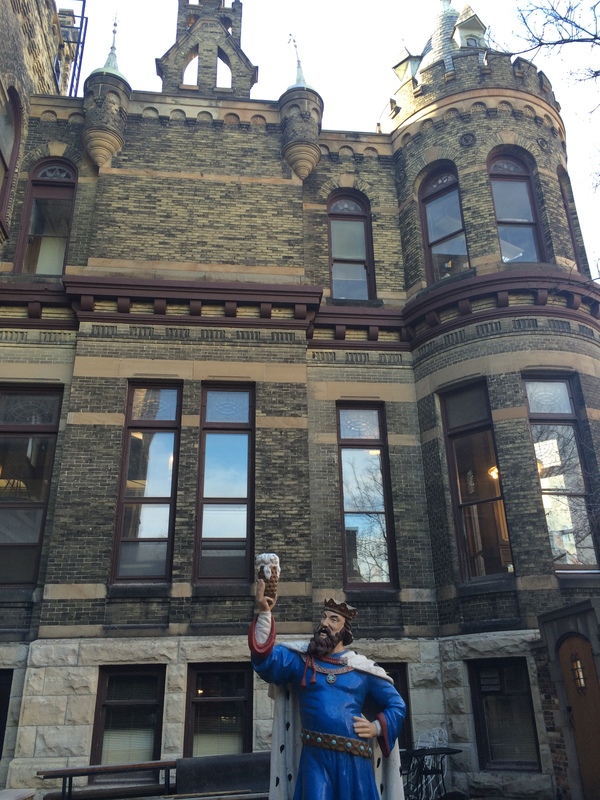 Then, on to the Pabst Brewing Company…Not a traditional brewing process tour, but rich in history and quite interesting, in my opinion. 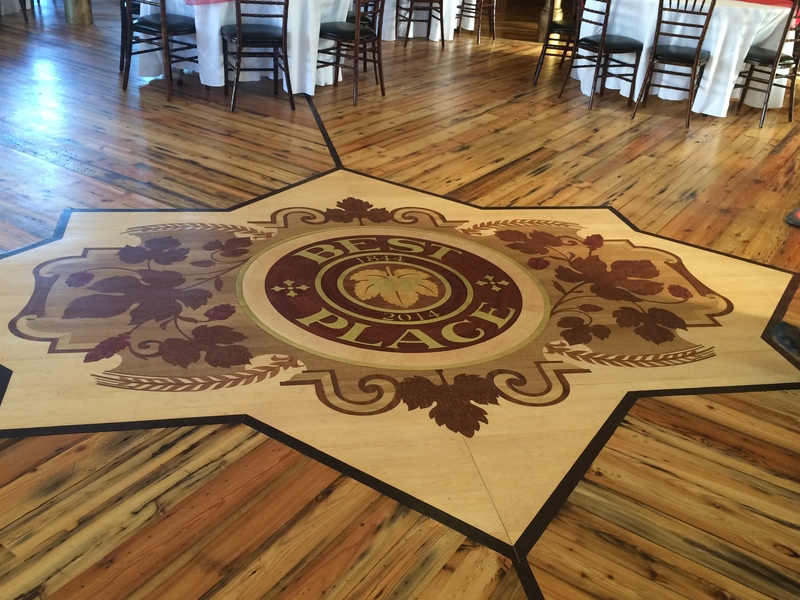 Though the tour doesn’t focus on the process of brewing beer, you still get to enjoy beer during the tour. Plus, this facility has a wonderful and intimate space in which to host weddings, parties and other celebrations. Lakefront Brewery… My neighbor, and friend, Andrew also joined us for LFB and dinner later. The Old German Beer Hall… Dana’s pick for dinner on the evening of her arrival. After all we had munched on at Lakefront Brewery, we were not as hungry as we thought we might be. Total bummer, because the German menu seemed to have real promise! We did polish off the Hofbräuhaus Brotzeitteller, which consisted of classic beer hall style bread, meat & cheese board, a 10oz pretzel, Rye bread & Obatzter with (local) Usinger deli meats, Swiss cheese, beer radish, and pickles. 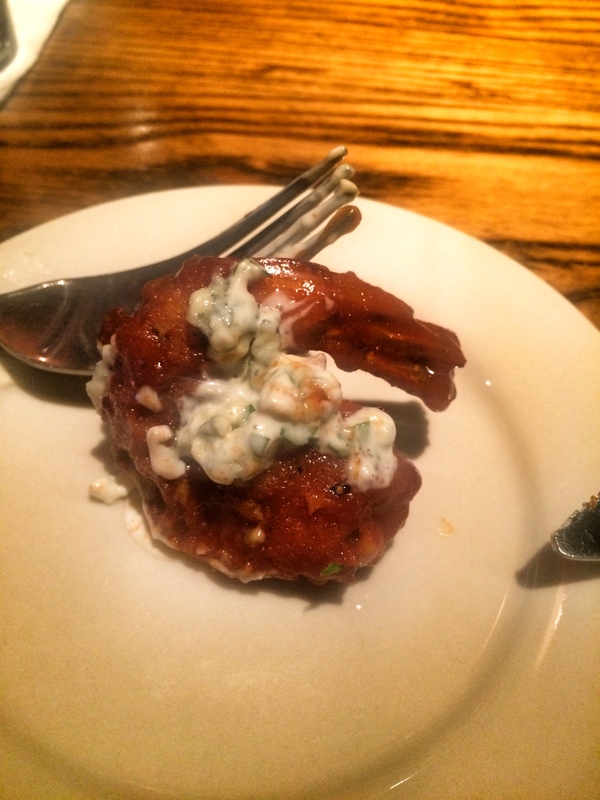 A great appetizer to pick at – a lot of variety, and very good food! We may have polished off a few beers as well. My choice… the Hofbräu Delikator – “Dopplebock” – actually, that was our server’s choice, and it was quite tasty! 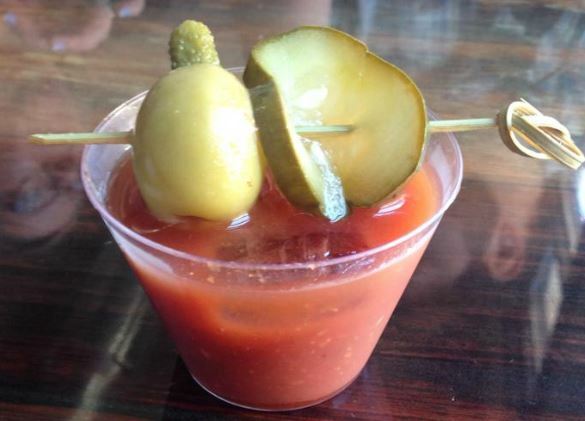 Now…on to the main culinary events! 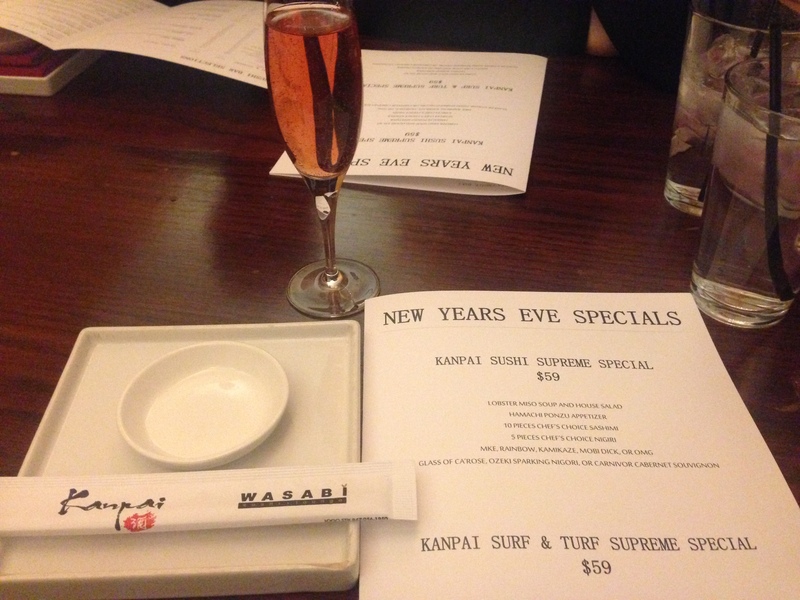 New Year’s Eve at Kanpai Izakaya… I made reservations for the five course dinner special. 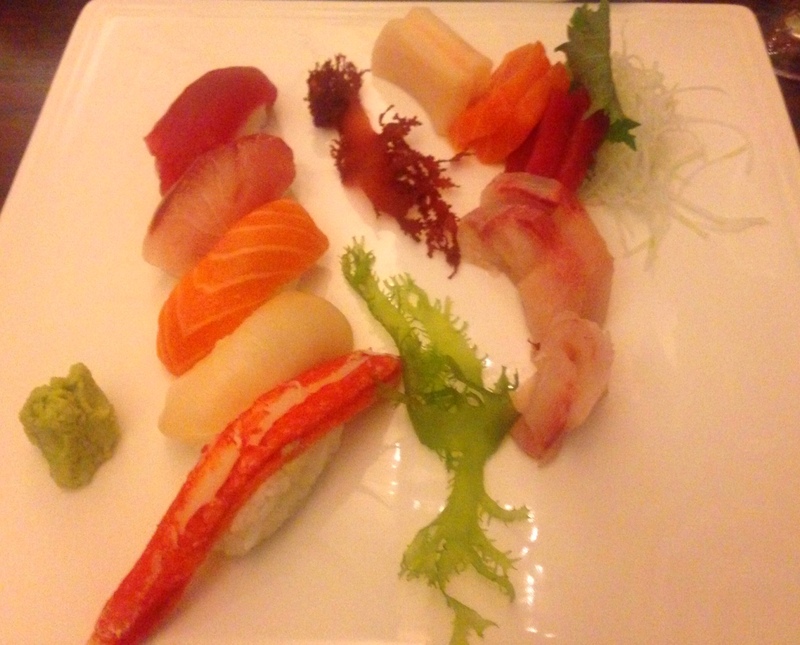 $59 / person, for fresh sushi, sashimi, and wine/Saki pairing? Yes, please! 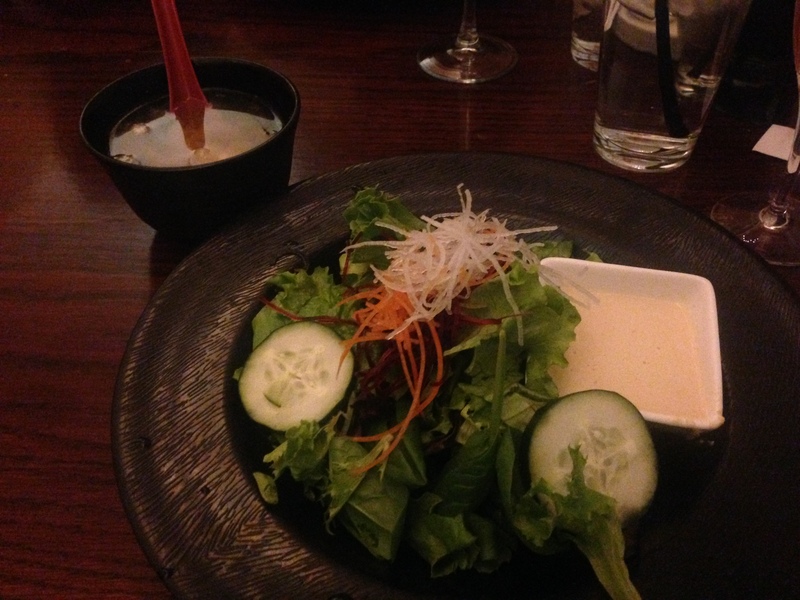 Courses one and two: Lobster Miso Soup and House Salad. The addition of lobster meat to the soup…brilliant! 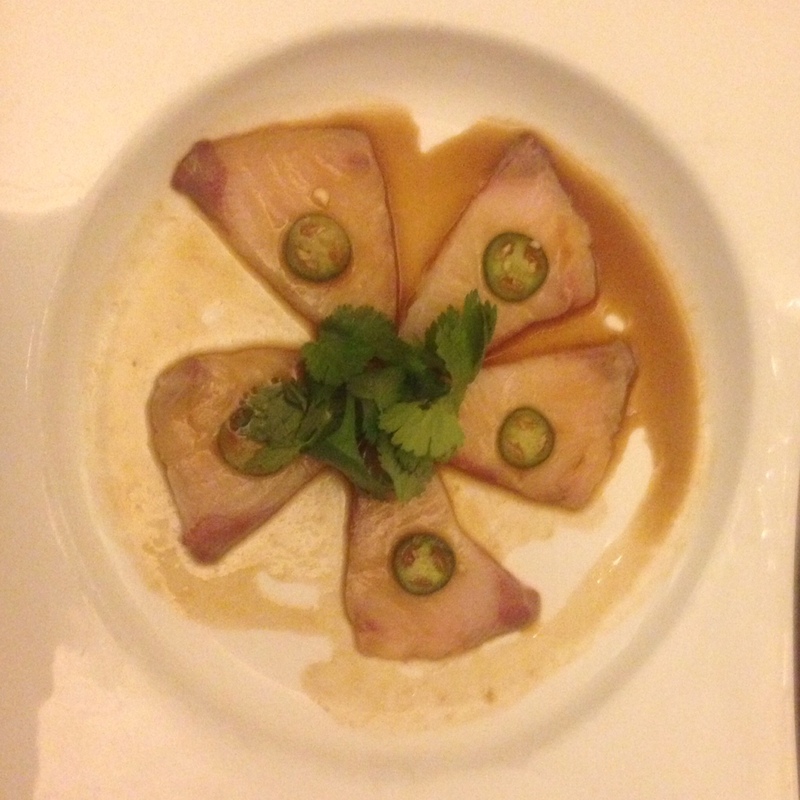 Hamachi Ponzu appetizer (course three). 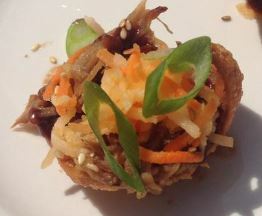 Course 4: The “OMG” roll as it cooks. 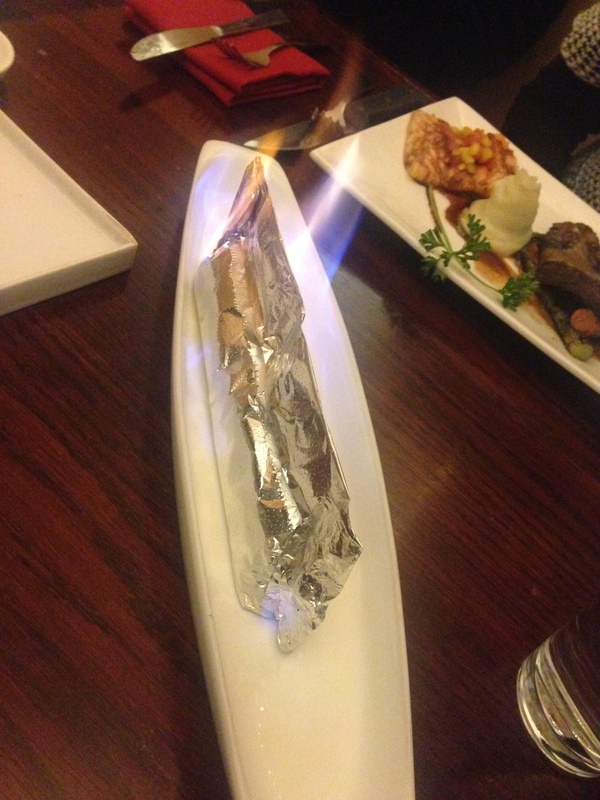 The roll has shrimp tempura, avocado, eel, shrimp, spicy and wasabi aiolis, and is served flaming under the fire of burning rum. The resulting taste is of a delicious grilled sushi roll. Everyone at the table enjoyed this roll immensely, as do I! The Chef’s Choice sashimi plate was the final delivery. Please allow me to say that, OMG, this was amazing!! If I had a proper camera, this plate would have looked even better. However, even with a phone camera, I hope you see just how beautiful all of the seafood looks! This lovely plates hosts a party of Crab, White Tuna, Yellow Finned Tuna, Salmon, and Talapia (the chefs were advised that Scallops were off-limits for this gal). 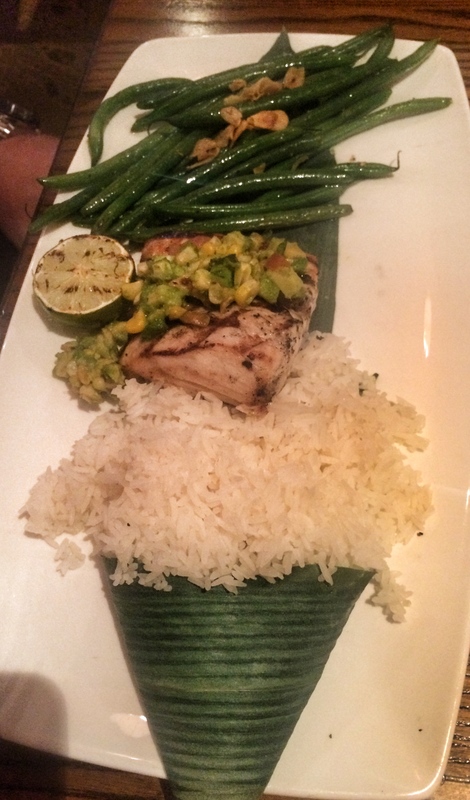 I’m not even kidding when I say that the fish melted in my mouth – and, the Yellow Finned Tuna was my favorite, by far! I’ve always enjoyed the food and service at Kanpai, but I think they managed to (somehow!) step up their game on NYE! And, Mary, thanks for wonderful service – always with a smile! Kanpai was a great start to our NYE outing! We then walked over to Cafe Benelux for a drink, and ultimately cabbed back to East Town to enjoy acoustic music (very good acoustic music!) at The County Clare. The County Clare was busy, but not overly crowded. Dana, Andrew and I had a great time just chatting, listening to the music, and watching folks (overly) enjoy their evenings. We also thoroughly enjoyed the complimentary bottle of champagne The County Clare provided just prior to midnight! What a wonderful way to ring in 2015! 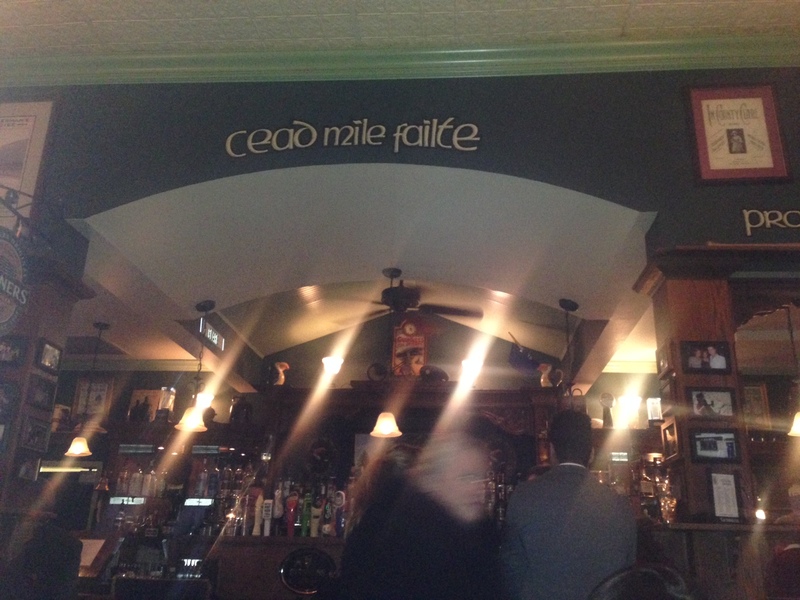 It was difficult to get a good photo with the lighting, but you see the “a hundred thousand welcomes” (céad míle fáilte)! 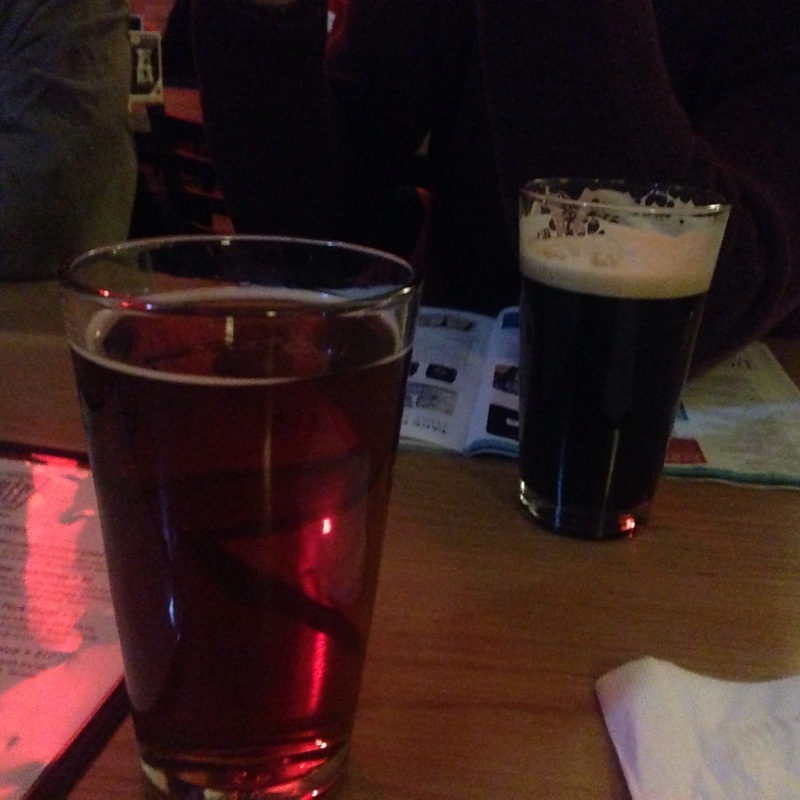 And…then came the After, After Party at GoodKind. After having heard about GoodKind from a colleague, and reading about it being one of the top 21 new restaurants in the US, I decided we should make reservations for the After, After Party Brunch on New Year’s Day. We had a lazy morning and then headed over to GoodKind in Bay View with my friend Katie in tow as well. We walked into an inviting atmosphere, busy with other brunchers! This was the inaugural brunch at GoodKind, so nobody, including the staff, knew exactly what to expect! After reviewing the day’s menu, I knew I couldn’t decide (except to eliminate the Smoked Rotisserie Pork Belly served with a Maple Buttermilk Cake. 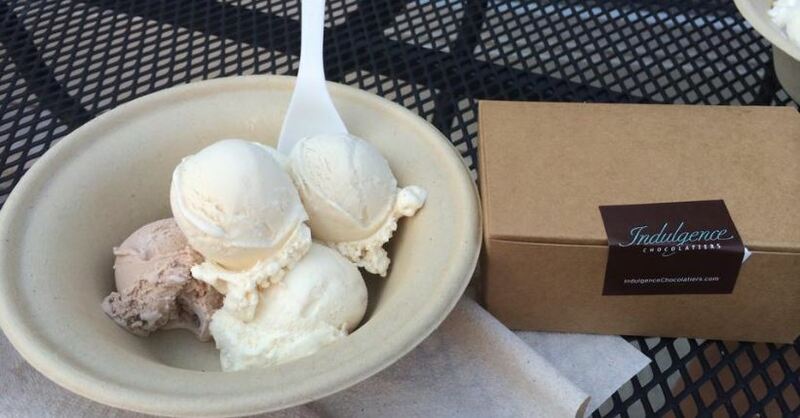 I LOVE pork belly, but there is no way anyone will get me to eat anything maple-flavored!) Everything else was fair game. Our server, Caitlin, advised us that most tables had been ordering tapas style and sharing dishes, so we decided to do the same. 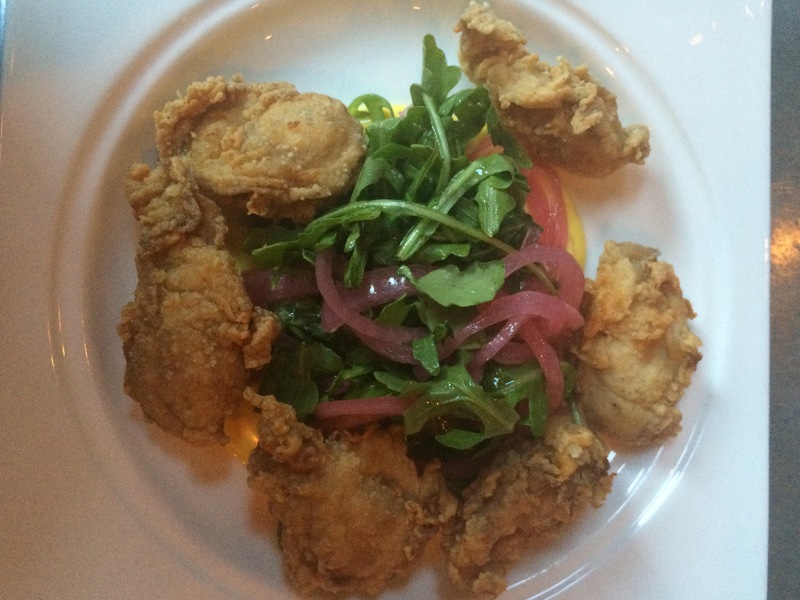 We took a few recommendations from Caitlin, and I asked her to choose an additional dish to surprise us. We started by sharing a bottle of wine. 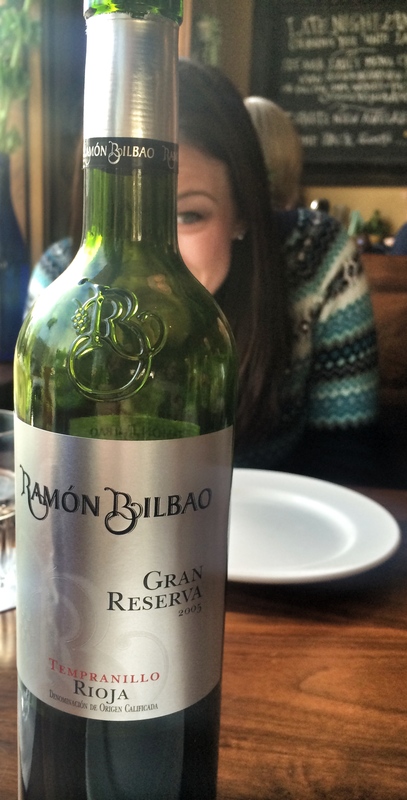 This Ramon Bilbao Rioja was rich in flavor and definitely improved as it sat. 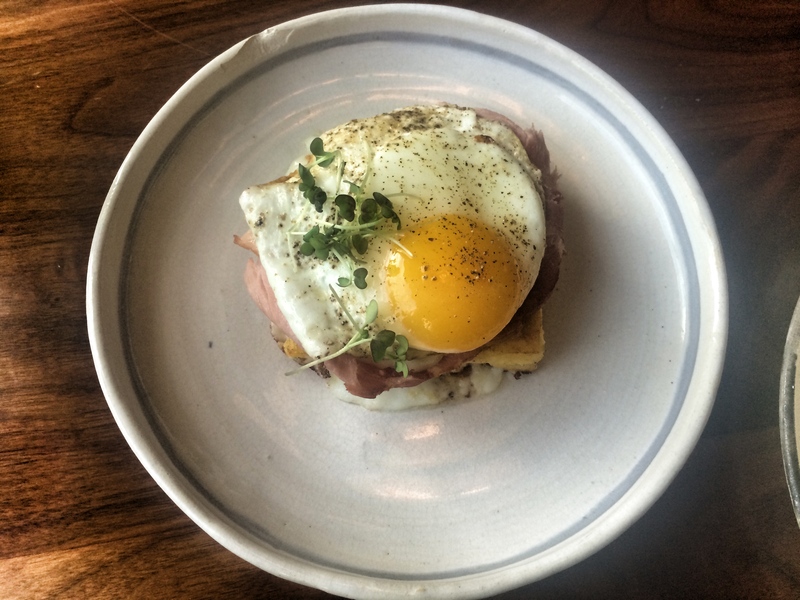 Polenta Madame with hometown ham, goat cheese curds and fried egg. What an extraordinary and savory delight!! 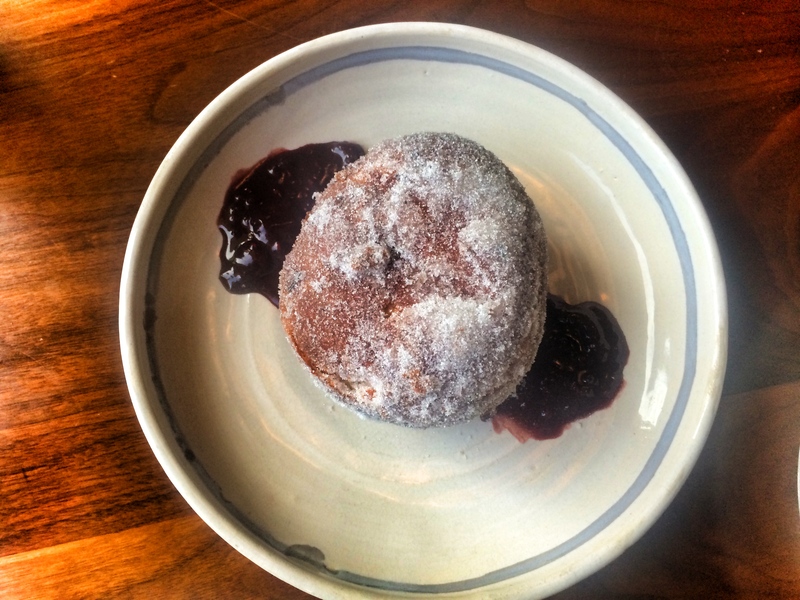 The Pork Cheek Donut – it’s just like it sounds…a sugary donut filled with tender pork cheek and served over a chocolate raspberry sauce. I LOVED the concept here, but I think the sweet overpowered the savory a bit. 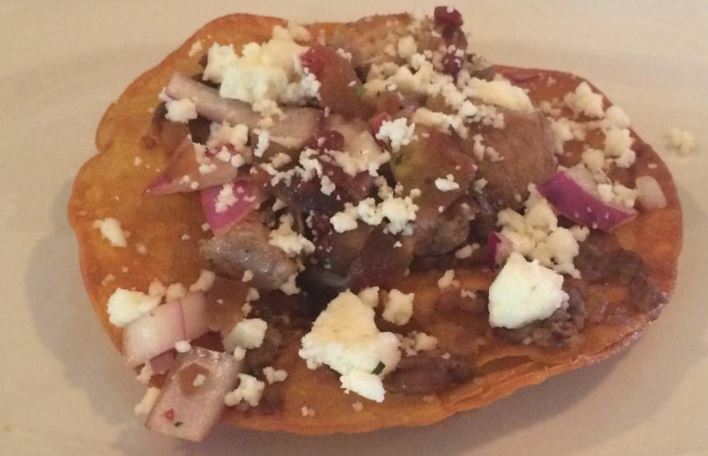 I would have loved to have a bit more pork in each bite. 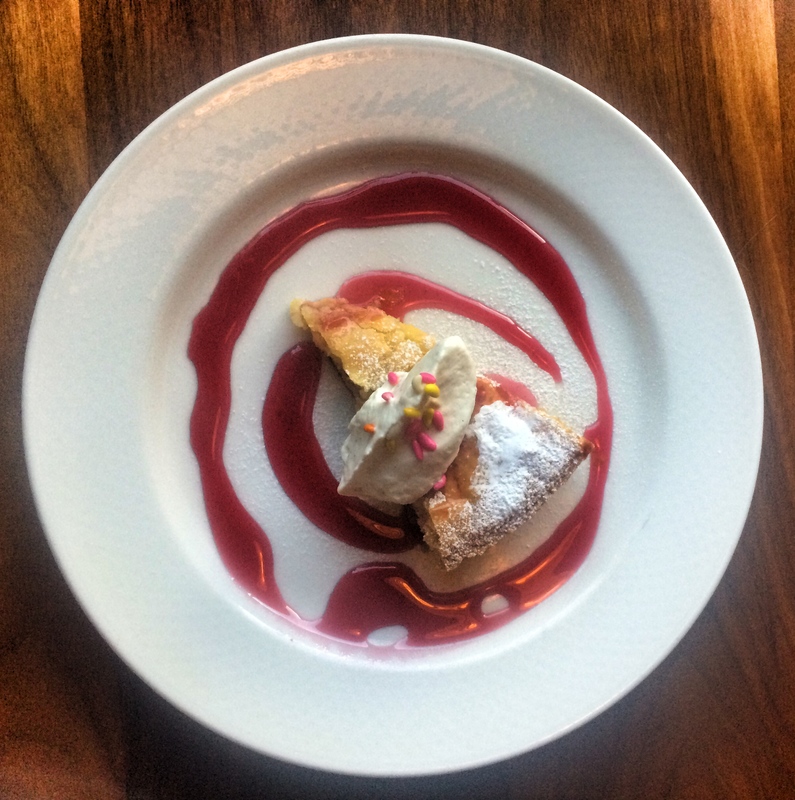 However, if you have a sweet tooth, this dish may be the one for you! 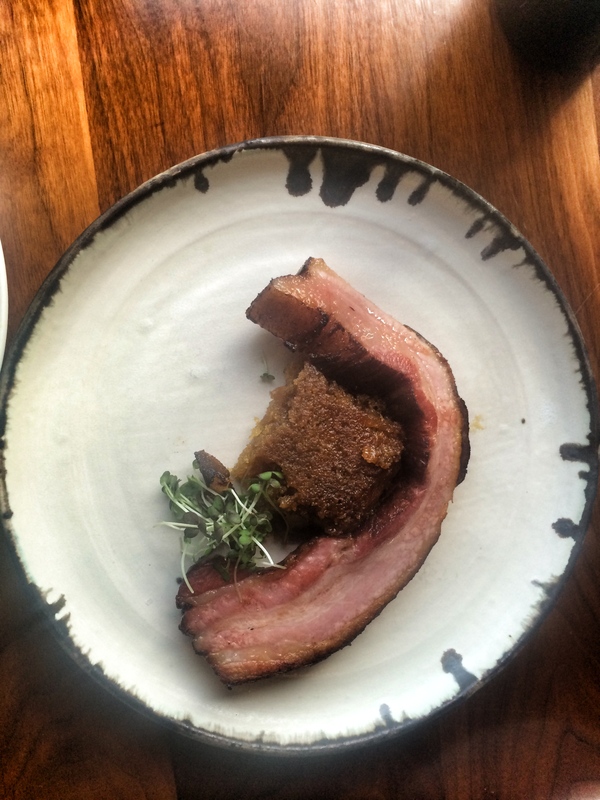 The aforementioned Smoked Rotisserie Pork Belly with Maple Buttermilk Cake was highly recommended by our server, so we did order that dish, After being assured by my friends that the pork did not have a maple flavor, I gave it a try. As it should be, the meat was very tender, if a bit high in fat content. And, Caitlin’s choice for us was the Dungeoness Crab Bread Pudding with frisee, tarragon and lemon vinaigrette. I thoroughly enjoyed this dish too! The crab meat was not overpowering, but what a rich flavor! I loved having a serving of savory bread pudding for brunch! 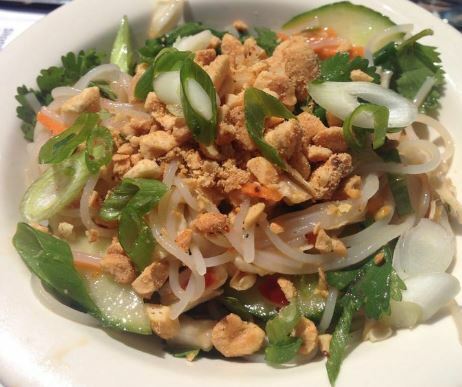 And, the frisee with lemon vinaigrette…so light and fresh! 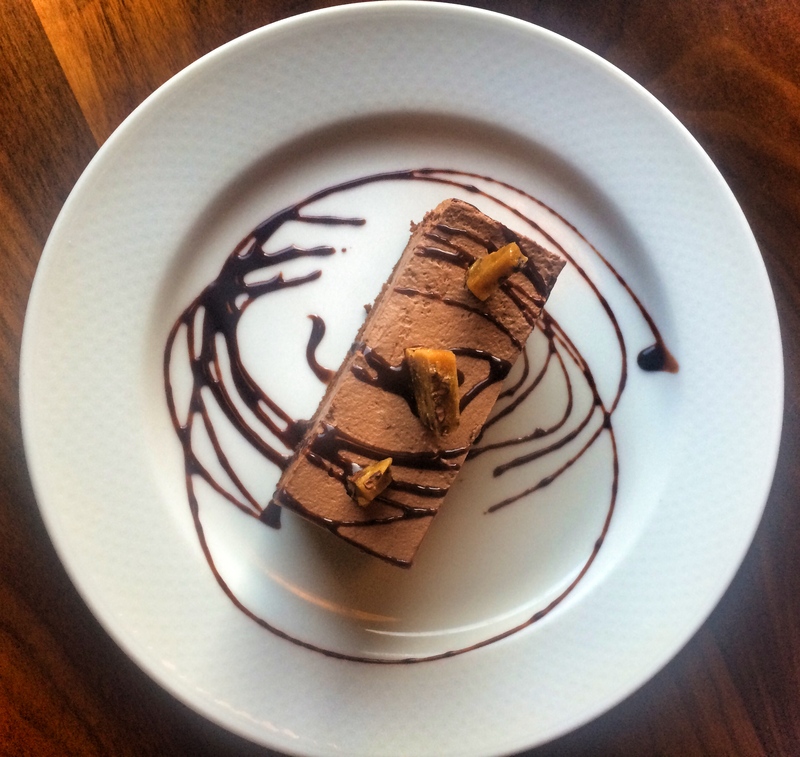 As if my friends and I hadn’t tasted enough goodness at GoodKind, Dana made the executive decision to order each of the two desserts that were being offered that day! I don’t recall what GoodKind named these desserts, but one was Door County cherry tart with whipped cream and anise sprinkles, and the other was chocolate cake, topped with chocolate mousse and brittle bites. We enjoyed both desserts, although the chocolate cake was deemed a bit too rich for my rookie friends! (I, on the other hand, thought it was super tasty!). I think the menu at GoodKind, being so unique, may seem a bit intimidating to some people. I encourage anyone who has the opportunity to take the leap of faith and to dine at GoodKind, knowing you’ll have great flavors served up! 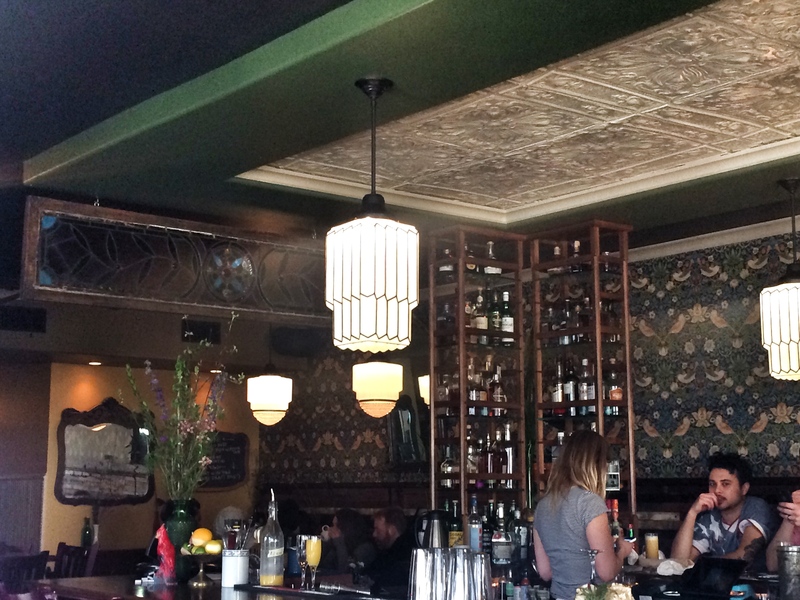 GoodKind will begin regular Sunday brunches this month, and I hope locals and visitors give it a try! If you’re into sushi, sashimi and the like, I really suggest Kanpai in the Third Ward. Neither my guests nor I have ever been disappointed there. 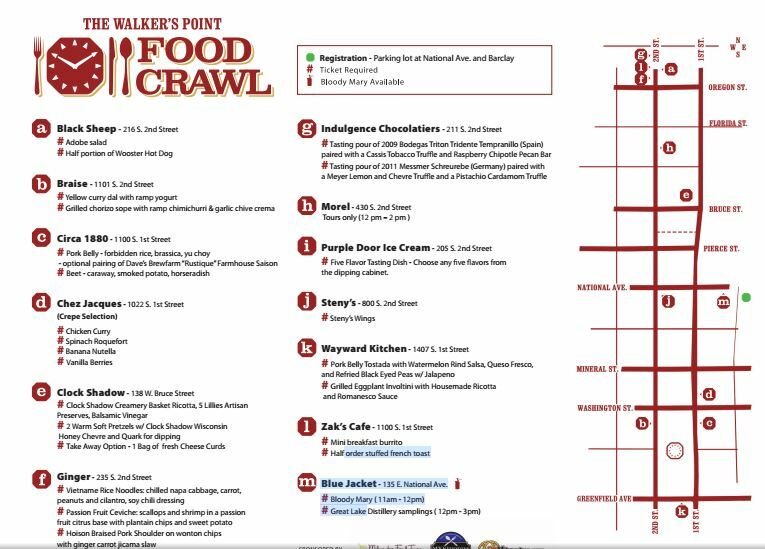 And, for local fare that is not fancy, but is just good, AJ Bombers, the Old German Beer Hall, and Lakefront Brewery are great local options. 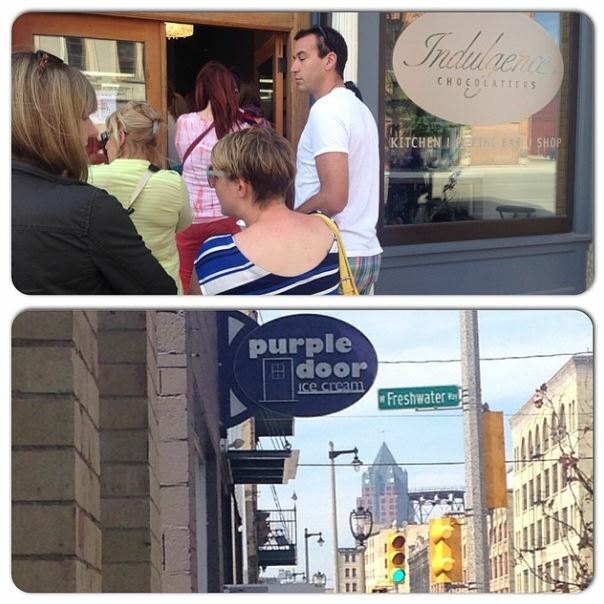 I hope you enjoyed our tour of Milwaukee over the past few days!